Wittenoom in Western Australia has been wiped off the Australian map but that isn’t stopping curious travellers from visiting the area. Mining of blue asbestos began in 1939 and in 1947 a company town was built for the miners and their families. 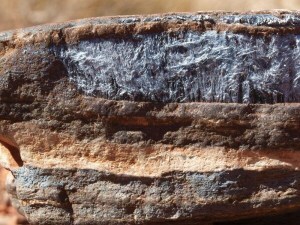 The blue asbestos mining operations were managed by Australian Blue Asbestos Ltd and CSR Ltd.
Blue asbestos has needle-shaped fibres which can penetrate the lung. It is harder for the body to naturally discharge fibres from this type of asbestos than fibres from other types. This is one reason why it is considered the most dangerous type of asbestos. In 2006 the government of Western Australia commissioned a report on the management of asbestos in the Wittenoom area. The report states that the waste ore which has been left after extraction of the asbestos is over 3 million tonnes and contains about 5% asbestos. At that time, up to 40 tourists were visiting the Wittenoom area every day. Tourists and others are disturbing the waste ore by driving over it. They are also visiting the gorge where the asbestos ore was mined. The risk to tourists and aboriginal people visiting the Wittenoom gorge alone has been categorized as “extreme” which indicates that there is an imminent risk of exposure to harmful levels of asbestos. In its heyday, the population of Wittenoom was like one big happy family. The mining companies organised social events for the workers and their families. But these companies have left an asbestos legacy. Even though many of the workers and their families were developing lung diseases, the companies neglected the risk that asbestos posed to their employees. The great beauty of Western Australia attracts many tourists to the area. It also contains sites of ceremonial importance to Aboriginal Australians. To protect visitors to Wittenoom the government has simply erected warning signs. But tourists and people passing through the area are able to ignore the extensive asbestos warning signs and are exposing themselves to asbestos dust and debris. As we know from pursuing asbestos disease claims for over thirty years, such exposure, even at very low levels, can lead to mesothelioma many years later. But there are no plans to clean up the tailings almost 80 years after they were first dumped there. River water downstream may still be contaminated over a hundred years from now. Indeed the state government has declared the town of Wittenoom as the greatest health and safety tragedy in Australia – comparable to the Chernobyl and Bhopal catastrophes. The dangers of working with asbestos have been known since the late 19th Century. The epidemic of asbestos diseases in the 1960s and1970s from heavy industrial use gave rise to increasingly stringent regulation of asbestos processes. The dangers of working with and using manufactured asbestos products are now widely known and well understood but the ongoing tragedy at Wittenoom shows that we have not yet come to terms with environmental and post-industrial contamination. In South Africa as well as Western Australia workers and residents of former asbestos mining towns have sometimes been able to obtain compensation through the courts or through schemes. In the UK some people who lived near asbestos factories have been able to claim compensation for their asbestos diseases and women who as children played in asbestos tailings in Armley, near Leeds, succeeded in their landmark claims. But the risks of exposure from old workings, from contaminated land and from the natural environment are not so widely known and are perhaps less well understood. Although we have achieved a great deal in facing up to the threat of asbestos exposure there is still work to be done.